Many visitors to Scotland are surprised by how narrow some of the roads are, especially if they’re not used to driving a large vehicle like a motorhome. Even passing other vehicles on normal A and B roads can feel very tight. But some roads are even narrower: single-track roads with passing places are something of a feature of driving in rural Scotland, particularly in the Highlands. Scotland’s Highlands and Islands often use single track roads with frequent passing places. These roads are less manicured than larger roads, but often have the most spectacular views! Photo credit: John M.
Visitors from elsewhere in Britain may have come across such roads. They certainly exist in rural parts of England and Wales. But they are very rare elsewhere in the developed world, and can cause worry and confusion. So here are our best tips for safe driving on single-track roads. Look out for passing places! Passing places are usually marked, normally with a black-and-white pole, with or without a white sign and the words “Passing Place”. However, not all passing places are marked, so you have to keep your eyes open for them. They can be on either side of the road. It is important to remember that in Scotland we drive on the left of the road (it’s easy to forget when there’s no other traffic to remind you). If the passing place is on the left pull into it; if it’s on the right, stop opposite it. Don’t try to pull into a passing place on your right – it’s one of the best ways to cause an accident. Not just for other drivers’s sakes but because single-track roads often lack fences and you may meet cattle, sheep, deer, horse-riders, cyclists and walkers. These roads are often so quiet that you have a good chance of seeing unusual wildlife, like pine martens. You may also meet hard hazards such as low bridges and tight bends, which can come up without warning. Should you meet a herd of animals, the safest thing to do is to pull in and switch off your engine until they have all passed. Horse-riders and cyclists should be allowed to pass you at their own pace; horses may be nervous of your large vehicle and cyclists are working much harder than you are! Think of your wait as a good opportunity to see the countryside, which can be difficult to do if you’re concentrating on the road ahead. The general rule is that whoever reaches a passing place first stops. Look ahead as far as you can, and pull in to the passing place in good time – it will save you having to reverse. Use your indicators to show the other vehicle that you’re pulling in. If they stop at the same time as you and flash their headlights twice, it usually means that they’re inviting you to drive on – but this is not a hard-and-fast rule, so don’t rely on it. If they only flash once, it is usually a “thank you” and means they know you’ve stopped and they are driving on; you may also get a cheery wave as they pass you. They’ll expect to be thanked if they give way to you, too. Keep an eye on your rear-view mirrors and use passing places to let any vehicles behind you overtake. The countryside may look as though nothing ever happens but a lot of people work there and they get very frustrated if they can’t pass you and get on with whatever they’re doing. Very often drivers who have overtaken will thank you by using their indicators or hazard warning lights for a few seconds – it doesn’t mean anything’s wrong. Passing places aren’t for stopping to take photos, have a picnic or park for the night; the clue is in the name! Nor are gateways, cattle-grid gates or other apparently-unused entries. You never know when a farmer or home-owner may need to use them – just because you can’t see a house doesn’t mean there isn’t one along the track, just over the hill. So only park in places where other vehicles can get past you. This applies overnight, too, since a home-owner may be coming home after dark or a farmer may be making an early start. Make sure anywhere you stop for any length of time is hard ground too! If an oncoming vehicle is bigger or harder to manoeuvre than yours (for example, a tractor with a trailer), then it is usually a good idea to kindly reverse to the nearest passing place. Always use a passing place, even if it’s quite a long way back, rather than trying to climb up on the verge. Road edges are often soft and narrow and can hide roadside drains, and you don’t want to get stuck. All our motorhomes are fitted with reversing cameras; make sure you’re familiar with using your camera and reading the screen before you need it. It’s generally considered good manners to give way to vehicles coming up a hill towards you, particularly large and/or heavy ones. It is much easier for you to move off downhill than it would be for them to start moving uphill again. Single-track roads with passing places are not everyone’s cup of tea but if you want to travel in the Highlands you will certainly meet them. The trick is to be relaxed but very focussed: think ahead, take it gently and don’t worry. The chances are that most of the vehicles you’ll meet will be smaller than yours and will wait for you to pass them. There’s no point in letting a quirk of British road-building keep you away from some of the most beautiful parts of the country. 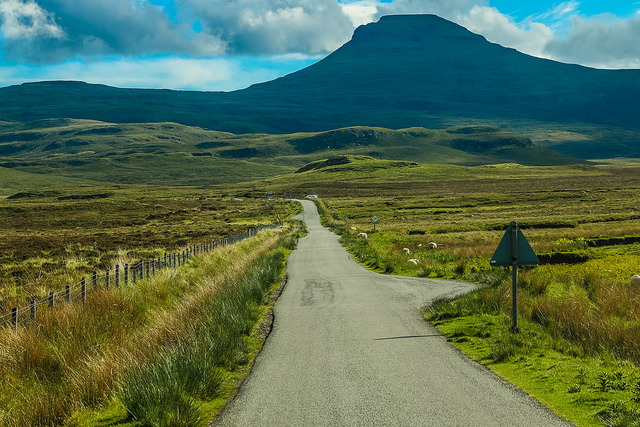 Hopefully these tips will have put your mind at ease about driving on Scotland’s smaller roads. As long as you relax, take care and drive courteously, you’ll have a great time. What’s more, you’ll see the full beauty of Scotland’s lochs, mountains and coast. What better motorhome holiday could there be?